Boarding for a new trip: we go to Singapore and Malaysia! The Legon Senior are in Penthéréaz for a visit bookending a trip to South Africa. 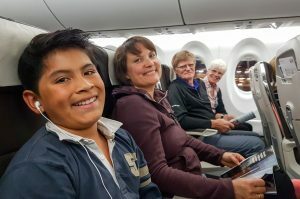 We have arranged for a visit in Singapore departing roughly at the same time as the their trip to South Africa in order to go to the airport together and realized later that we were actually on the same plane for the first leg of the trip to Zürich. At five pm, we are all ready and packed and we pile up in the Touran. We have an uneventful ride to the airport were Skye as reserved a parking spot. Last time, when we were about to leave for Colombia, we really thought we were not going to be able to park. After a quick check in, it’s time for an apéro at the Montreux Jazz Café before boarding. In Zürich our gates are close by in the same terminal, and it’s fun to part ways, one part of the family headed for Africa and the other for Asia. We are really tired, so we manage to sleep during most of our 12 hours flight and don’t mind too much that the choice of movies is not really exciting.